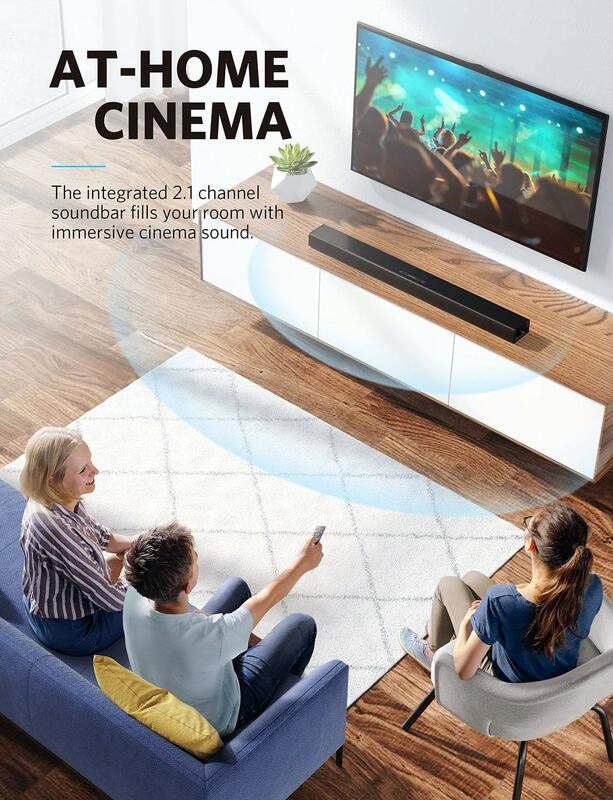 Immersive Sound: The integrated 2.1 channel build is optimized to fill your home with 103 dB of rich surround sound. 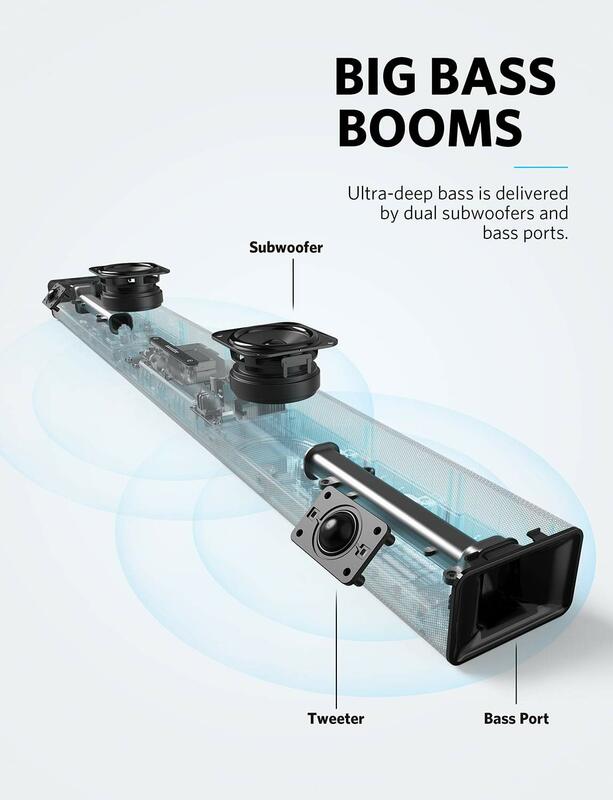 Huge Hit Of Bass: Two built-in subwoofers and bass ports produce low frequencies that are further intensified by our exclusive BassUp technology in Music mode. Stunning Clarity: Dialogue mode utilizes Infini's dual tweeters and our advanced DSP technology to put crystal-clear voices center stage. Flexible Placement: Extended 35" design is optimized to deliver the same stunning sound whether wall-mounted or placed in flat under your TV. 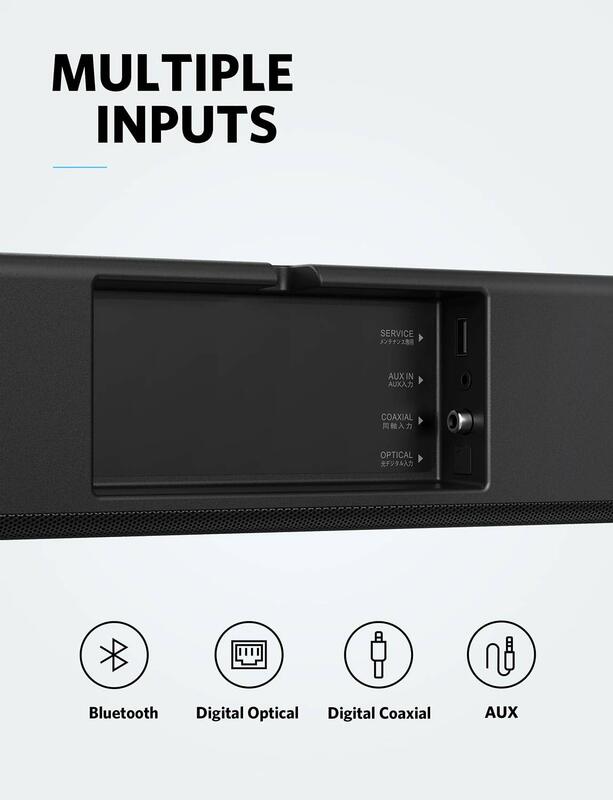 Convenient Input Options: Connect via optical, digital, or coaxial inputs. Alternatively, use AUX cable or Bluetooth streaming to link to more devices. 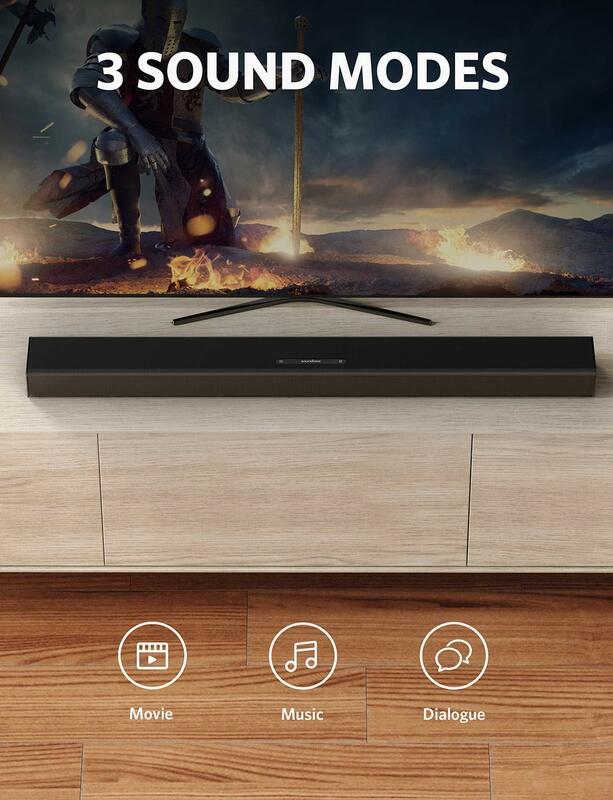 Use the remote control to easily control the soundbar. Lights. Camera. Action. Two tweeters, subwoofers, and bass ports fuel huge 100W output, while exclusive Bass Up technology tailors low frequencies to create deeper, intensified bass. Together they create breathtaking sound which immerses you completely in the action. 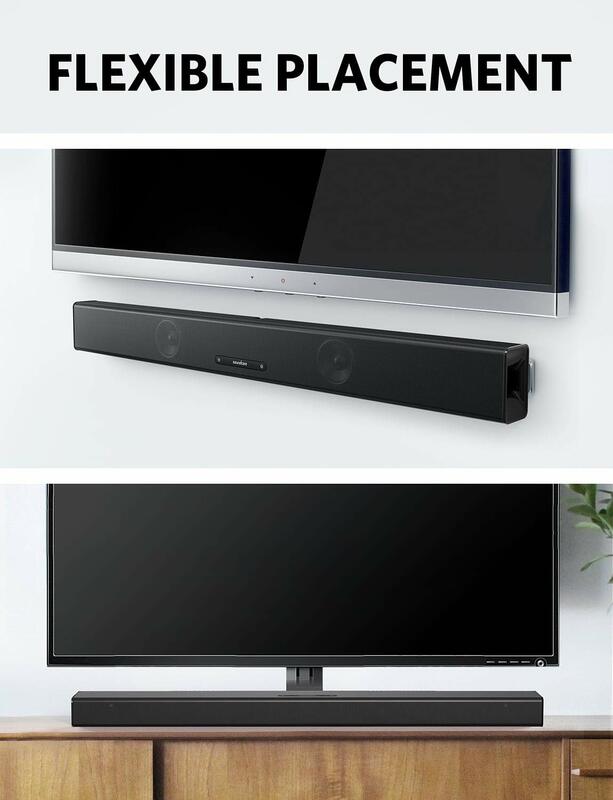 Flexible placement The dual-orientation design delivers the same Cinema sound experience whether the sound bar is placed in front of the TV or mounted on the wall. Infini's 2.2 inch height ensures a clear view of the screen. 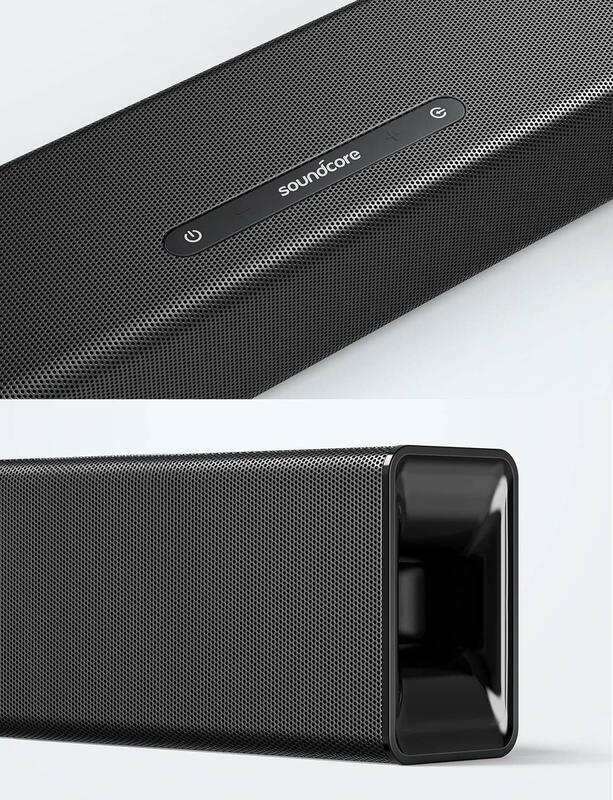 Tailored sound modes movie: intensified bass and virtual Surround Sound put you center stage. Music: highs and Mids are well balanced with enhanced clarity and a big hit of bass. Dialogue: mid-range is enhanced to ensure you hear crystal-clear dialogue which doesn't get masked by other sounds. Wireless music streaming connect any device with Bluetooth to stream music, podcasts, and more. Input options connect to your TV or other devices using an optical, digital coaxial, or aux connection. Dual control Infini has both a remote and built-in buttons for convenient control of the volume, sound modes, and switching between wired and wireless connections. 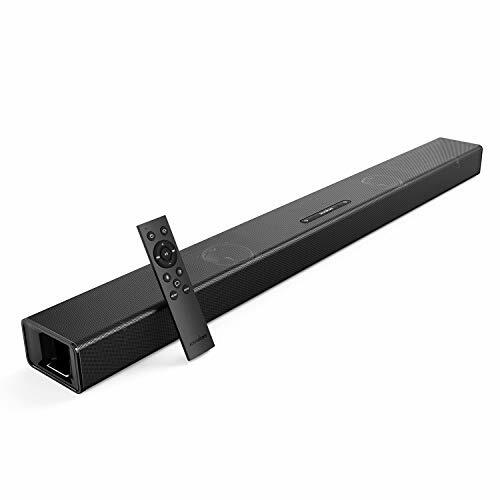 What you get: Soundcore Infinite, power cord (4.9 ft.), remote Control, 2 AAA batteries, 3.5 mm to RCA audio cable (4.9 ft.), 2 Wall mount screws, 2 wall mount brackets, wall mount TEMPLATE, user manual.